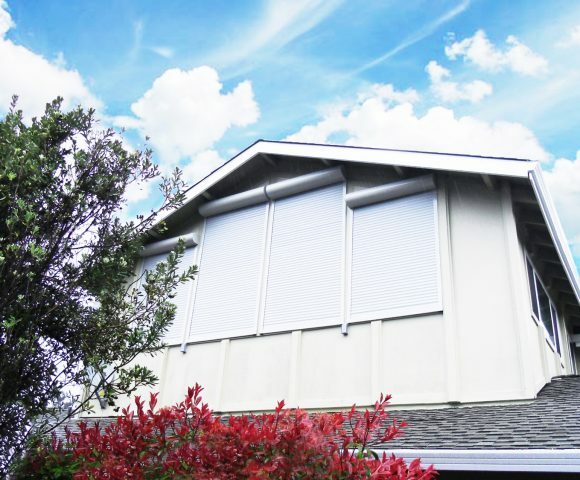 Get control over the sun and your home with our electric Exterior Rolling Shutters! Homeowners tend to have a love-hate relationship with the sun. You want to let the natural light brighten up your home, but sometimes that leads to living areas that get avoided as they are too bright, too hot, and just downright uncomfortable. UV rays damage your floors, furniture, and paint- all of which lower the value of your home over time. And don’t forget: UV can harm you and your loved ones! Our heavy duty rolling shutters deter burglars from entering your home. And do it all with a simple push of a button through a remote control, wall switch or your phone (iPhone, iPad & Android)! 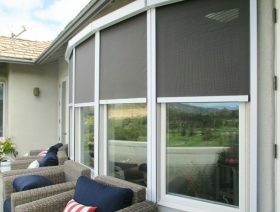 Roll shutters block the sun’s UV rays, creating cool comfortable spaces in your home and yard. In the cooler months, they also block out the cold, the wind and driving rain, while deterring intruders looking for easy entry into your home. Watch our 5-minute video to learn more! 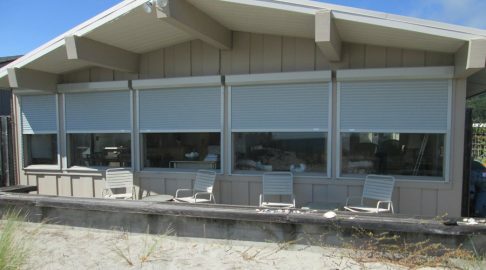 Our motorized roll shutters will reduce outside noise – take back your home’s peace & tranquility! Angled, horizontal, and “bottom-up” shutters are available! These, and other custom-made options, mean we can 100% match your home and your window’s decor. 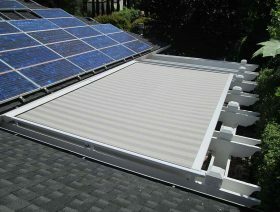 Cool down your indoor living space by over 15 degrees as the electric rolling shutters roll down in under 15 seconds! Check out our Exterior Shutters Photo Gallery or our Houzz Photo Gallery to see some beautiful installation pictures and to get an idea how our exterior shutters might look on your home. 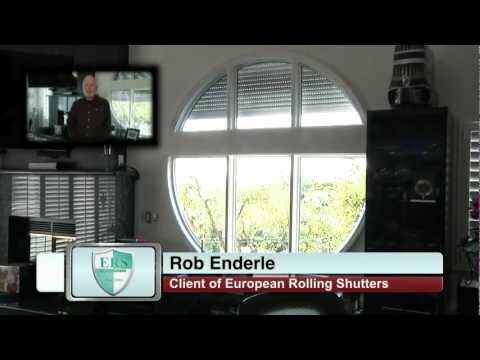 European Rolling Shutters is a family-owned company in San Jose, California. Our exterior shutters, in addition to our other exterior shading products, are custom-made and installed to fit the specifications of your home. 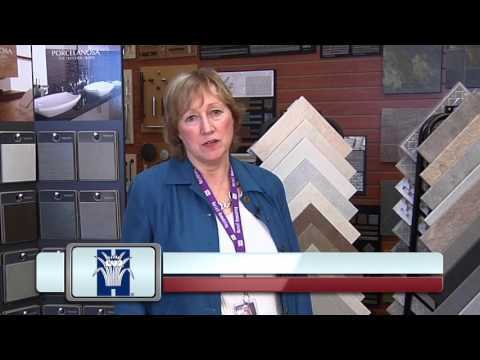 Each of our high quality products come directly from our California-based factory and showroom. 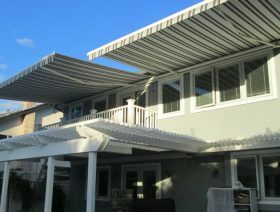 We are the only company in California that custom designs, fabricates and installs exterior shading products from start to finish. Get in touch with us now! 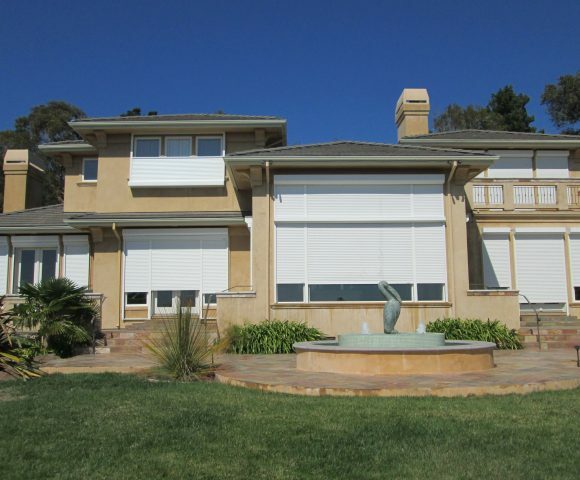 We’ve proudly installed our custom-made rolling shutters on Bay Area homes since 1983 and the words of our customers are the testament to our quality and service. Visit us on these pages to read reviews from our customers. 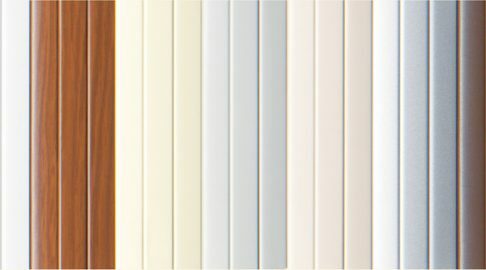 Our exterior shutters come in a variety of earth-tone colors which blend beautifully with your outside décor. Standard colors include white, crème, natural silver, beige, gray and brown. Or we can provide more exotic, custom colors at a premium! 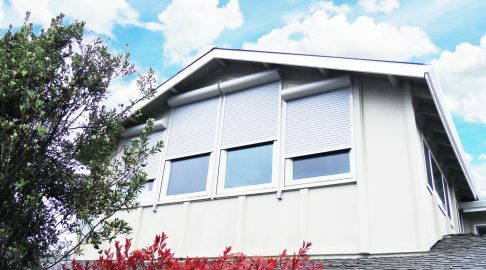 Take a tour inside our San Jose factory to see how our exterior shutters are assembled and then installed on a nearby home. Rolling shutters weather sensors are uncommon; however, the wireless Ondeis sensor can still be utilized to add an additional layer of protection to your shutters to prevent weather damage. 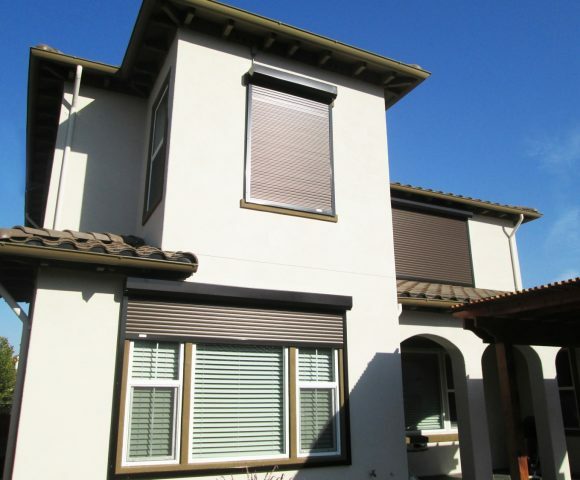 European Rolling Shutters is one of the only companies in the country that manufactures, sells, and installs exterior shading products all under one roof. That means we know our rolling shutters better than anyone. We have faith in them, too. That’s why you get a 5-year warranty on the exterior window shutters we install on your home. You get aluminum-alloy protection and a long-lasting improvement to your home; it couldn’t be easier. 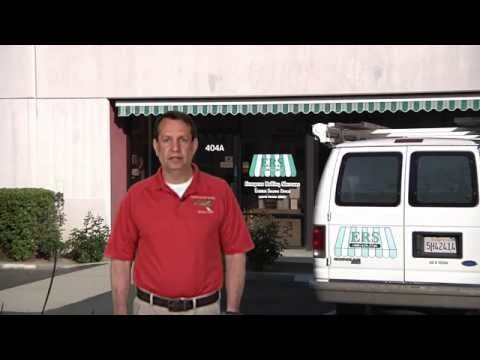 In fact, all you have to do is call us at 408-629-3740 or click below to send us an email. We’ll schedule a FREE in-home estimate with you and you’ll take the first step to adding value, protection and efficiency to your home! Enjoy Year Round Comfort with Exterior Window Shutters! Our exterior rolling shutters add value to your home while they make you feel comfortable during any season or weather conditions. Sunshine, heavy rain, wind or frost – our shutters stop it all. Even hurricanes are no match for these shutters. Built with sophisticated, high-quality aluminum alloy materials, these window shutters are far superior to plastic or wood interior blinds in both quality and appearance. German engineering makes them highly durable and abrasion resistant. That makes our exterior rolling shutters a smart investment for the windows in your home! The long-term value of our motorized roller shutters is something you don’t want to miss out on. By simply having our outdoor shutters installed, you add instant, real value to your home. And that value lasts -- in so many ways. You probably spend hundreds of dollars a year cooling and heating your home. 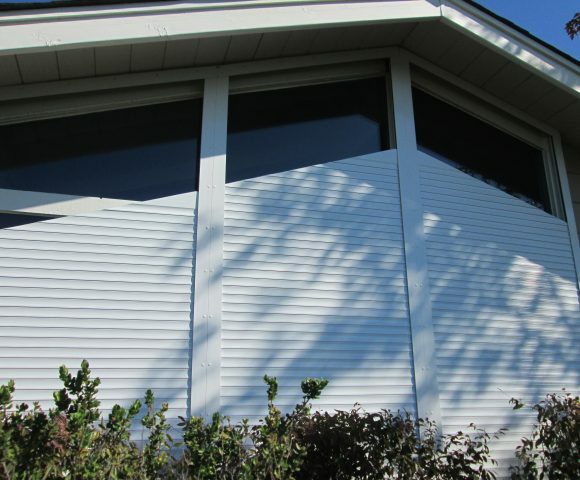 With our exterior rolling shutters, you could completely block out sunlight and prevent your home from heating up too much in the summer. During the winter, these same rolling shutters will help ward off the cold. Not only do you decrease your energy costs and consumption, but you also reduce wear and tear on your HVAC system. Exterior window shutters do much more than reduce your energy costs. It’s an unfortunate reality that opportunistic thieves and burglars will try to invade someone’s home simply because they can easily see into the house and effortlessly gain access through windows or sliding glass doors. You can protect yourself and your family by never giving burglars a chance. With a quick press of a button, the exterior shutters roll down, lock in place, and give your family and your home aluminum-alloy protection from outside threats. It’s the simplest and easiest way to prevent home invasions while adding substantial value, comfort, and energy savings to your home. They’re more than a cooling shade for your home: they’re a practical investment in the security and financial value of your property. ERS was named “Best Window Covering/Shutters” company in the Best in Silicon Valley Reader Choice Awards for the third year in a row! We’ve been proudly serving the greater San Francisco Bay Area for over 20 years, and we’re confident you’re in good hands. In fact, we are the only company in California that custom designs, fabricates and installs exterior shading products from start to finish.